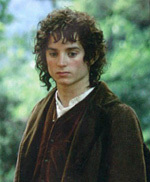 Elijah Wood plays Frodo Baggins, a young Hobbit whose quest is to bring the One Ring to Mount Doom to be destroyed. Elijah Jordan Wood was born on January 28, 1981, in Cedar Rapids, Iowa, to his father, Warren, and mother, Deborah. Elijah has an older brother, Zachariah, and a younger sister, Hannah. Elijah started modelling as a young child, and also did television commercials in his early youth. When he was seven years old, his mother took him to Los Angeles for a modelling convention, where he was quickly noticed by an agent, Gary Scalzo, who offered to represent him. The Wood family moved to Los Angeles shortly thereafter. Elijah’s first starring role was in 1992’s “Radio Flyer”, a fantastical story about two young brothers that build a flying machine to take them away from their abusive home life. The next year saw him taking on the role of Disney’s main character in “The Adventures of Huck Finn”, as well as television appearances on “Witness” and “Showtime 30-Minute Movie.” 1993 continued to be a busy year for Elijah, as he portrayed the part of “The Good Son” against another famous child actor, Macauley Culkin. Elijah’s next movie, “North” (1994), was an outlandish comedy directed by Rob Reiner, that gave the actor a chance to try his chops at comedy in the role of the perfect child trying to find a new set of parents. Although North was critically reviled, Elijah got another chance to show his talent in “The War,” which starred Keven Costner as his father, a Vietnam veteran who watches his own past being mirrored by the war between Elijah’s character and his friends. Elijah took a break from showbiz for a couple of years after “The War,” but came back with the movie “Flipper” in 1996, about a boy and his friendship with a dolphin. His next movie, “The Ice Storm,” (1997) was a critical success, and his role as a troubled young teenager is especially of note. His next roles, “Deep Impact” and “The Faculty” (both in 199 showed that the young actor had the skill to go with his maturing good looks. A string of roles in lesser-known and indie flicks such as “The Bumblebee Flies Anyway” (1999) and “Chain of Fools” (2000) might have been a portent of his future career, though, if it hadn’t been for a certain trilogy based on J.R.R. Tolkien’s Lord of the Rings. When Elijah heard that the Lord of the Rings was being cast, he rented a Hobbit costume, went into the woods, and taped several scenes from the movie, to send to Peter Jackson as an audition tape. Jackson liked what he saw, and knew that he had his Frodo. Elijah spent most of the next three years in New Zealand working on the hugely successful Lord of the Rings movies. Recent projects of his since the Tolkien trilogy include “Try Seventeen” (2002), and “Eternal Sunshine of the Spotless Mind” (2004). He currently lives in New York with his sister Hannah. Fun Facts: Elijah’s most well known bad habit is biting his nails, and you can see his ragged nails in several shots in Lord of the Rings. He does indeed smoke, and picked up the habit from Josh Hartnett while filming “The Faculty.” Elijah plays piano, and can sing well from all accounts. He is a huge fan of music, and has said in the past that the Smashing Pumpkins are one of his favorite bands. He also has mentioned being a fan of Star Wars, as well as enjoying playing video games. His Fellowship tattoo is located on the lower right side of his waist. One of the One Rings used during filming was given to him after the movies were finished.